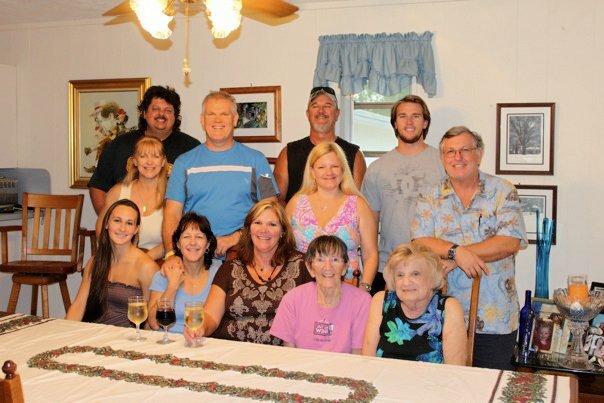 The value of family/friends has slipped underneath the value of a dollar. 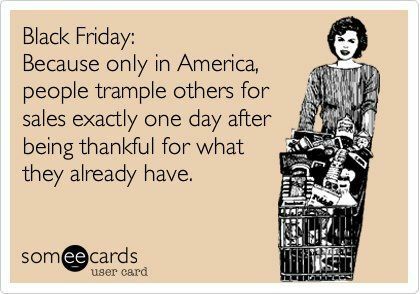 1) Starting this crazed, consumeristic day known as ‘Black Friday’ on Thanksgiving Day. I already find the whole day ludicrous. I have never been to a Black Friday. Reason why? It’s pointless. I am more than happy to wait for a sale at a store during the year than to worry about being the first one in line RIGHT AFTER an important holiday where we celebrate the value of family, friends, and things we are grateful to have in our life. However, if that’s your thing, by all means CONSUME. These past couple of years, stores and consumers have been pushing this heinous tradition into Thursday. It’s already a travesty that people are desperate enough to wait in a long line outside, in any weather, to save $50-$100. But to now rush to a store on the same day we are meant to see the value in what we already have? It truly shows how far this country has been driven into wanting more, and more, and more. I blame not only big business, but consumers. Stores give you the opportunity to go and shop, but YOU as a consumer aren’t forced to go. We’ve perpetuated a greed-filled system where we will choose a discounted computer over time spent with a loved one. And to parents: Is THIS what you want to teach your children? That you will abandon a wonderful holiday with family values to stampede through a store so you can tell them you got their expensive Christmas present for $50 less than you would have had to pay otherwise? “My mommy loves me more than yours because I got an iPad Air. You’re mommy didn’t get you one.” What? 2) Employees are the ones who truly suffer. Let me start by saying that there may be people who LIKE working on Thanksgiving. They may want the extra money they make during that day (especially if they don’t make enough to support their family on minimum wage). But, for those who want to be at home with their family, they are FORCED to work (check out Kmart’s way of dealing with their employees). They are called in to cater to all you greedy consumers. And I’m not afraid to speak out about those who go pick up a piece of ‘discounted’ technology or jewelry or clothing on Thanksgiving. It’s sad. Contrary to popular belief, most stores aren’t taking a hit on Black Friday. “Oh, I’m getting the best deal!” No, you aren’t. That item that you are drooling over with the 60% off sign, is actually not worth its original price. They’ll put a price that is outrageous, then slap a discount on it to make you believe you are getting this monstrous deal, when really, you are just buying a regularly priced item. And if you are getting a ‘bargain’, it’s probably the same bargain you would have received during a regular sale day at the store during the year. Don’t get me wrong, if you are one of the FIRST people in the store, you might get lucky. But is it worth it? Black Friday is all about commercialism. The big men on top see those twinkling dollar signs in everyone’s eyes as their knees weaken over some silly sale. Let me express: I am the biggest bargain shopper. I cut out coupons like they are gold. But I don’t do it at the expense of celebrating time with my family and friends. Did you see that word? Expense. Because that’s what it is. I urge you all, keep Thanksgiving untainted. It is a time to be thankful for all the things you have in life. Don’t let greed cloud that. Give something that can never be bought. Give love. Give time. Give back. Barnes & Noble, Bed Bath & Beyond, the Burlington Coat Factory, Crate and Barrel, Dillard’s, Nordstrom, Neiman Marcus and Patagonia, Bloomingdale’s, Costco, Marshalls, GameStop and T. J. Maxx, American Girl, BJ’s Wholesale Club, DSW, Hobby Lobby, HomeGoods, Home Depot, Jo Ann Fabrics, Lowe’s, Marshalls, Petco, Pier 1, Publix, REI, Sam’s Club, Sur La Table, Talbots, and Von Maur Department Stores. And I don’t care why they are closing— whether it’s because they truly value family, they would lose money by staying open, or wish to gain publicity from it. The fact that they are closed means more people will get to be with their family. BUT, there should be a small window for that to occur (say 8am to 11am). That way, everyone gets the opportunity to be at home with their family. And a last, tremendous THANK YOU to the men and women who look out for us on this special day. You are sacrificing time with your family to uphold your duty. This not only includes hospital/clinic workers, paramedic teams, firefighters, and the police, but other public service workers as well (such as those who volunteer to help others enjoy a beautiful thanksgiving day).